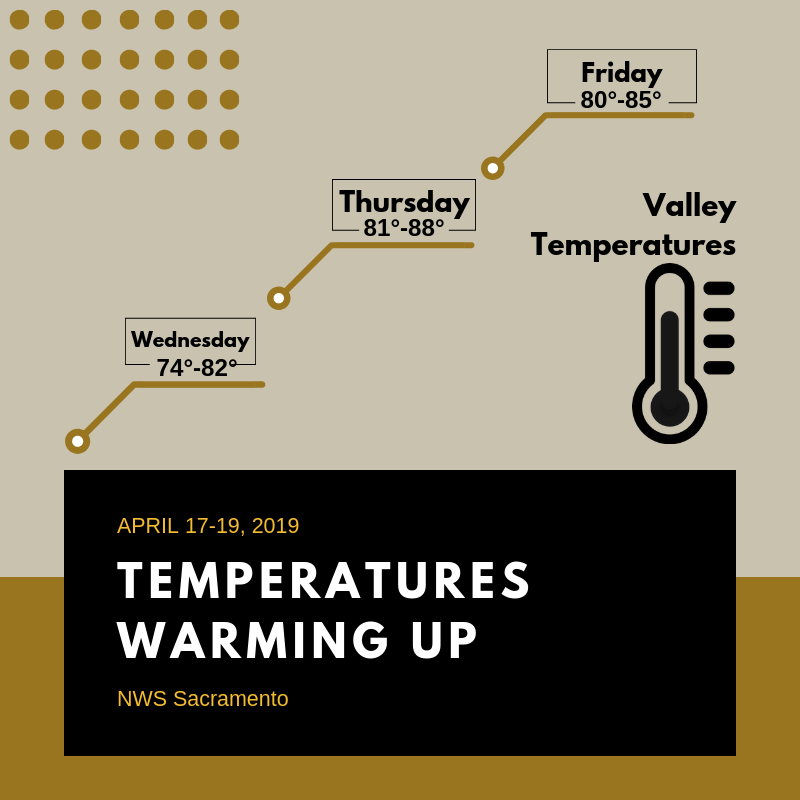 April 17, 2019 – Dry and warmer conditions expected the rest of the work week. Some light precipitation is possible over the weekend with high snow levels. Clear skies cover the region early this morning as ridging from the eastern Pacific moves in. Current temperatures range from the upper 20s in the mountain valleys to the upper 40s to mid 50s across the Central Valley. A strong warming trend is expected the next few days as high pressure and subsidence dominate. 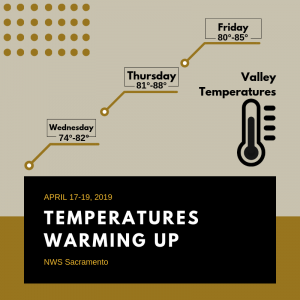 Highs today will warm about 10 degrees compared to Tuesday, and readings will be up another 3-6 degrees on Thursday with 80s expected through the Central Valley (around 10-15 degrees above average). Approaching short-wave may bring slight cooling as early as Friday with around 10 degrees of cooling possible Saturday as it moves through. The system will bring a chance of showers to the northern mountains Friday, with shower chances spreading south Friday night into Saturday. Snow levels will be high with little to no travel impact expected. A trough will pass over southern California this weekend, which will drop our high temperatures several degrees. Valley highs will peak in the mid to upper 70s, while the foothills top out in the 60s to the low 70, and the ridges rise upper 50s and 60s. Early next week, high pressure is forecast to build, which will raise our high temperatures once again.